Angela Perkins celebrates at a "Survivor" immunity challenge April 25. So many questions, and only three weeks to get answers. Perkins, the 42-year-old Iraqi War veteran, advanced on the 11th episode of "Survivor: Ghost Island" Wednesday, May 2, when two contestants were voted out of the game in a new twist. She has a 1-in-8 chance of wining. Of the remaining eight, six are from Perkins' original Naviti tribe, which has controlled the game since the Feb. 28 premiere. 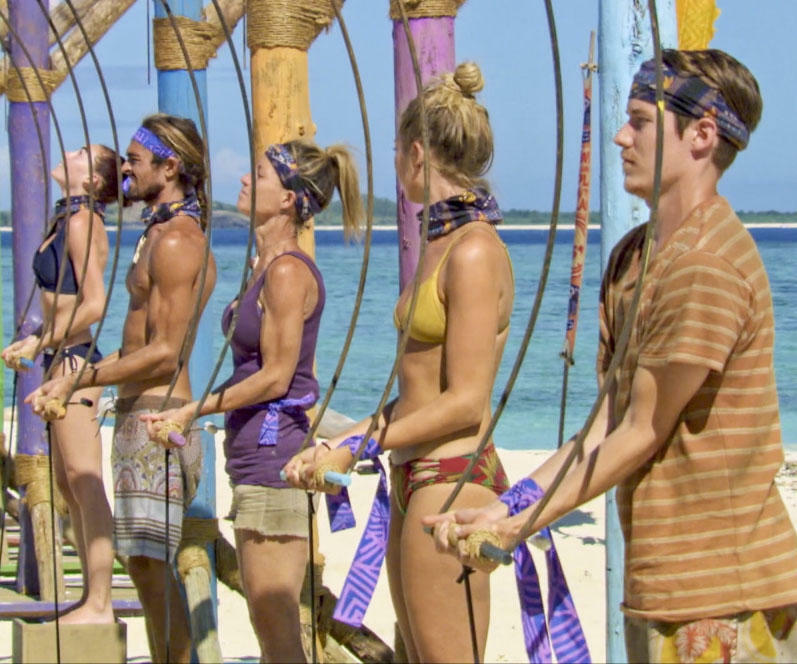 Angela Perkins (center) competes for immunity with (from left) Chelsea Townsend, Sebastian Noel, Jenna Bowman and Donathan Hurley. On Wednesday's show, the 10 contestants were divided into two groups for the immunity challenge. Chelsea Townsend from Salt Lake City and Domenick Abbate from Neconset, NY – both original Naviti – won immunity. Each of the groups went to tribal council and eliminated two original Malolo members: Michael Yerger of Knoxville (at 18, the youngest on the show) and Jenna Bowman from Detroit. Angela Perkins at Buffalo Wings & Rings viewing party March 7. Perkins again flew under the radar. She was barely seen or heard, unlike two weeks ago when she won immunity. She's not been a power player – at least as these shows are edited – but she's been a loyal contributor who could become a finalist, particularly if the Naviti leaders turn on each other in the show taped last year on Fiji. The Michigan native said she served 21 years in the Army, retiring as a captain after deployments to Iraq (2003-04) and Afghanistan (2011-12). Her son, 20, who attends Cincinnati State, calls her "an American badass." She also has a daughter, 22, in nursing school near St. Paul, Minn. Both are graduates of Clinton-Massie High School. After the Army, she divorced and rented an apartment "after giving up my dream home to my ex and everything we worked for just for the opportunity of being on 'Survivor,' " she said. 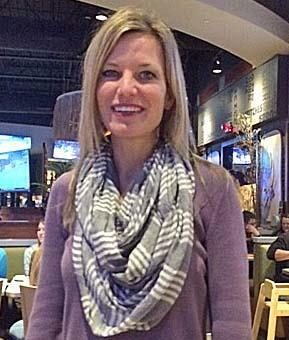 Perkins has attended "Survivor" viewing parties at Buffalo Wings & Rings, 5517 Kings Center Drive, east of the I-71/Kings Mills Road exit north of Kings Island. "Survivor: Ghost Island" airs the next three Wednesdays (Channel 12, CBS). The finale will be two hours (8-10 p.m.) Wednesday, May 23, the last day of the May ratings' sweeps. And the crowd goes wild! A packed house at Mason's Buffalo Wings & Rings cheered for hometown favorite Angela Perkins when she narrowly avoided elimination on "Survivor: Ghost Island" Wednesday night.